Christiania Hubbard was born at Blewitt Street, Newport Monmouthshire (Gwent) on 9th of October 1861 to George Hubbard & Christiania Evans. Christiania Hubbard had seven sisters and two brothers. Soon after her birth, the family moved to the Railway Station, Meopham, Kent, where George became the station master. They lived there for around nine years before George got posted to London and lived at 17 Blucher Road Camberwell. Christiania must have lived here for some time, but before 1881 she had moved out. In 1881 she was working as a barmaid in the Kings Head Public House, 390 Holloway Road, Islington, London. The landlord was Fredrick Anliss from Great Slaughton, Huntington. She later moved to Margate, as when she was married she gave her address as the York Hotel, Margate, Kent. On the 10th of September 1885, at the St Giles Register Office, she married Henry James Jennings (born 25th April 1831, to Gentleman; Thomas and Susanna Cooper). Henry was living at 53 Lincoln's Inn Fields, London. They lived at 53 Lincolns Inn Fields and had a daughter Muriel (born 8th June 1886, at 66 Fentiman Road Kennington). But Henry never knew his daughter as he died on the 20th of February 1886. After the death, Christiania moved to Fentiman Road and later lived to 29 Ravensdon Street, Lambeth. She married Peter Macgregor on the 20th August 1890 at St Barnabas, Pimlico and in the presence of Richard Edmonds and Mary Hinse. Peter's address then was 162 Ebury Street, Victoria. Christiania's was 29 Ravensden Street, Kennington. 162 Ebury Street and 29 Ravensden Street as they are now. By 1891 they had moved to 4 Warman Terrace, Seville Road, Worthing, with Muriel and a servant. They then moved to Shoreham (Ravens Road) and Hove. At Hove they lived at 27 Walsingham Road and then Rutland Gardens. · Peter Macgregor, born Worthing on 17th January 1892, Died 25th November 1918 in Aberdeen. · Ivor Gregor Macgregor, born at Shoreham on 25th April 1894. · Christiania Macgregor, born at Hove on 2nd October 1895, died of whooping cough 15th November 1895. · Claude William Macgregor, born at Hove, on 8th November 1897. 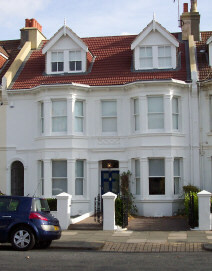 Christiania died of typhoid on the 11th of July 1899 at Hunston, Rutland Road, Hove. Her grave is at St Leonard's Aldrington in Hove. Her sister Edith Hubbard looked after the children prior to Peter’s death, and she brought up Muriel after he had died. Peter only survived her by two years before dying of a brain tumour on 22nd April 1901. William York Macgregor, Peter's brother, took responsibility for his young orphans after he died. They were moved up to Scotland and the eldest two studied at Dollar Academy. Claude studied at Edinburgh Academy. Muriel married Percy Roe and they lived a secluded life in "Sunny" Worthing. They died in the early 1960's.